Right now I'm in Strasbourg, France. The semester has ended in Singapore, and I'm on the road as I usually am at these times, with a few lectures and a conference ahead of me in Germany and the Czech Republic. Strasbourg is in Alsace, a region that France and Germany were fighting over for most of the last few centuries. That's made it a good symbolic site for monuments to recent European cooperation and the hope for world peace. 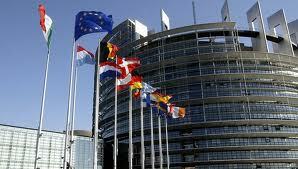 The building depicted here is the European Parliament. I'm generally optimistic about the future of humanity, and the history of Western Europe over the last 60 years is the kind of story that supports optimism. Nations that had been slaughtering each other for centuries in horrific ethnic, religious, and nationalistic conflicts have managed to put aside their differences and achieve a high level of material prosperity through cooperation. There are serious economic problems in Europe at present, but the possibility of millions of people killing each other in a Europe-centered World War is so far off the table that nobody even thinks about it. And there's really no force to lead us backwards -- the economic incentives support positive-sum international cooperation rather than negative-sum military conflict. That the last century started so horribly and ended so well for Europe is a nearly unfathomable human achievement. I don't think that the Israelis and the Palestinians or the Hutus and the Tutsis or the Hindus and Muslims are going to be at each other's throats for the rest of human history. Establishing the preconditions for peace will be hard -- it took centuries for things to fall into place for France, England, and Germany. But I'm optimistic that as long as humanity doesn't completely wreck itself through global nuclear war or extreme climate change or some other planetary catastrophe, all the peoples of the world will find their way to a European ending. I find what you say reassuring, Neil. When I find myself having a wonderful time in cities with tragic histories, even having visited memorials to those times, I sometimes wonder if there is something wrong with me. I think maybe it is seeing the triumph of the better nature of human beings. When/Where will you be in Germany? I will be in Stuttgart next weekend. I'm always surprised by how often my students talk about how the world is falling apart and descending in to violence today. It betrays a lack of historical perspective. There are some bad things happening, certainly, but compared to the past, violence and war have decreased significantly.